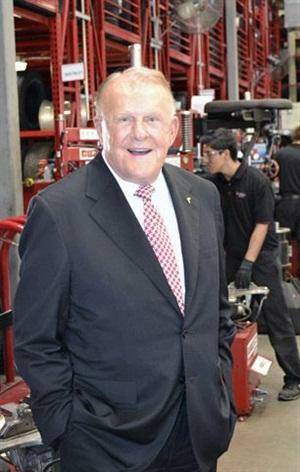 Bruce Halle was born on the 27th May 1930, in Springfield, Massachusetts USA, and is a businessman, very well known as a founder and chairman of the tire and wheel retailer Discount Tire Company, which currently owns over 900 stores based in 28 states. Halle has been active in business since 1960. How rich is the businessman? It has been calculated by authoritative sources that the overall size of Bruce Halle’s net worth is as much as $6.7 billion, as of the data presented in late 2016 – Discount Tire Company is the main source of his wealth. It must be said that currently he is listed as the richest person in Arizona, the 78th richest person in USA and the 240th richest person in the world by Forbes magazine (2016). To begin with, he was raised in Springfield, Massachusetts, but is a graduate from Eastern Michigan University. The library on the above mentioned university’s campus is named after him. Concerning business, Halle made several unsuccessful attempts to at businesses alongside partners, before taking the decision to work on his own. Bruce did not have a particular business plan, just rented an old building in Ann Arbor, Michigan, prepared the place and displayed a sign showing tires, and three days later the first customer came along. Little by little the company grew, earning loyalty from customers by providing great service at a reasonable price. It should also be said that Halle is very attentive towards his employees, and has a strict promotion model. Currently, Halle has 16,046 employees who work in more than 900 stores located in 28 states across the USA. Generating $3.9 billion in revenue, and as such is the largest retailer of tires in the USA. The key people who helped the company to reach such a level are CEO – Michael Zuieback, CFO – Chirstian Rowe, COO – Ed Kaminski and Vice Chairman – Gary Van Brundt. Finally, in the personal life of the businessman, Bruce Halle is married to Diane Cummings; they have four children, and the family resides in Paradise Valley, Arizona, USA. Moreover, Bruce Halle is attentive not only to his employees and customers; he is to society, and is a noted philanthropist especially to those in need. He founded Bruce T. Halle Family Foundation with the help of which he has made a number of donations to the Children First Academy, the Diane Halle Centre for Family Justice as well as for the homeless children school. The foundation has helped various health associations like the Muscular Dystrophy Association, the Juvenile Diabetes Foundation, Childhelp, the National Multiple Sclerosis Society, the American Red Cross, the American Liver Foundation, the American Cancer Society, the American Heart Association and many others. Recently, he made a donation of $1 million to help stop cannabis legalization in the state of Arizona. As a resident of Arizona, he funds the Arizona Kidney Foundation, the Arizona Opera League, the Arizona Boys and Girls Clubs, the Scottsdale Symphony, the Phoenix Symphony and the Crisis Nursery. Profession Businessman, founder and chairman of "Discount Tire"